Here, in this article, I’m demonstrating an upgrade from cloud control 12c to 13c on a linux machine. It is required to take a look at the https://docs.oracle.com/cd/E63000_01/EMUPG/preface.htm#EMUPG101 upgrade document before proceeding further and make sure that all the pre-requisites are met. Few things to consider before you proceed with the upgrade. 1. 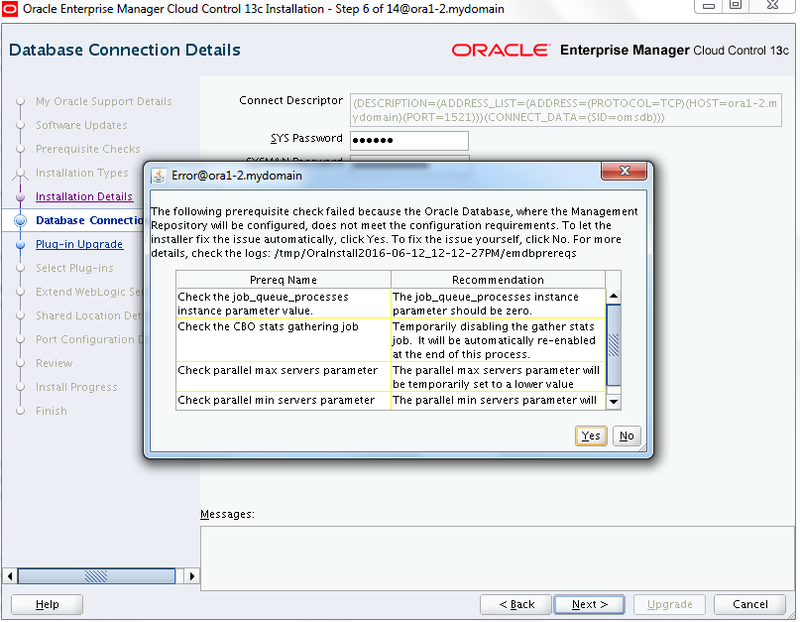 OMS 13c repository database needs to be on 12.1.0.2 version. 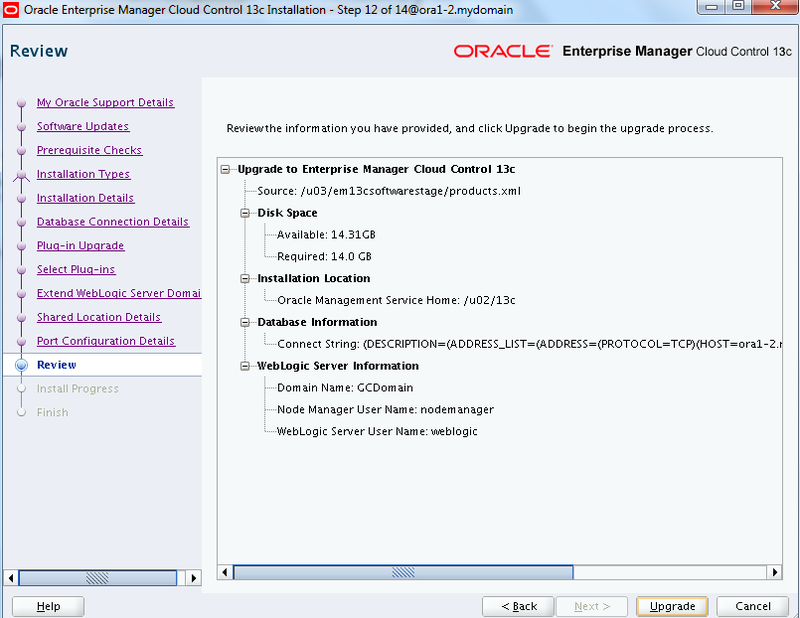 So, if the repository database is on a pre-12c release, then you need to upgrade it before upgrading the Cloud control. 2. 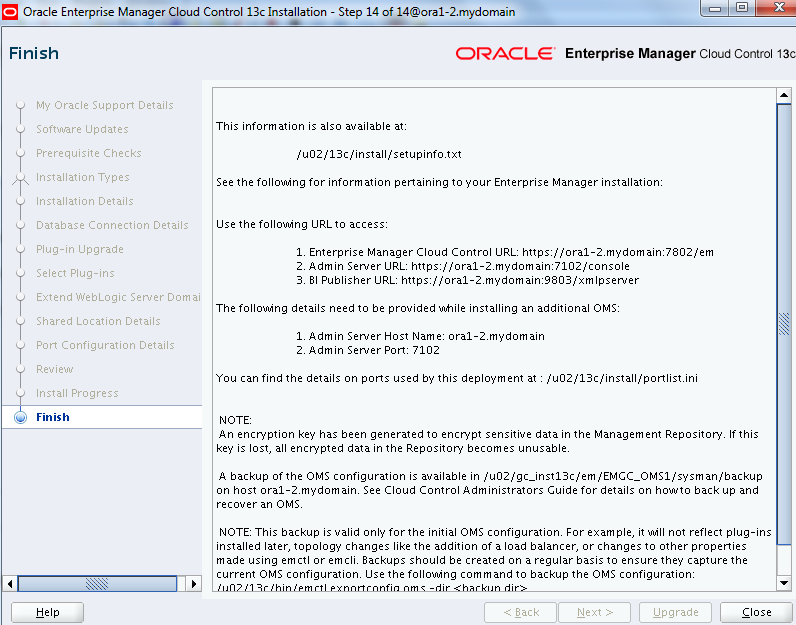 Cloud control 13c is not supported on OEL/RHEL 5 and so are the 13c agents. 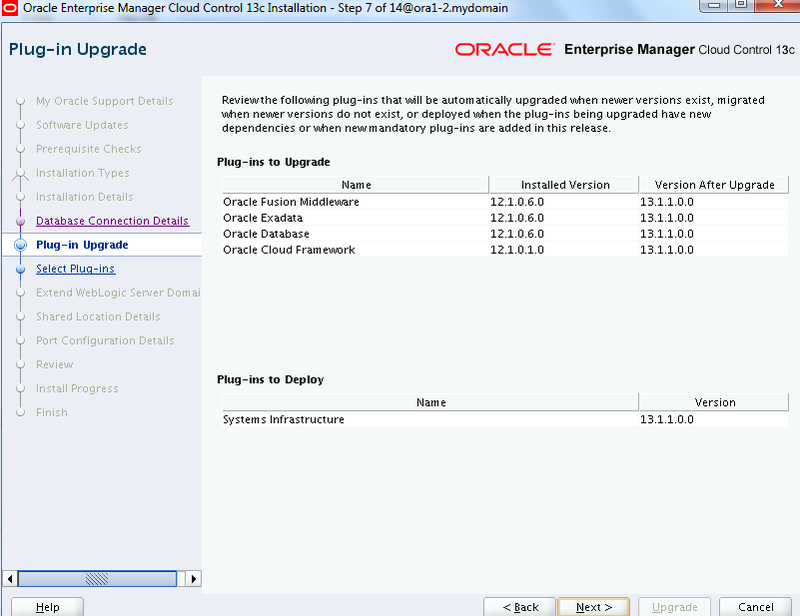 You cannot upgrade cloud control 12c on linux machine less than version 6 to 13c. 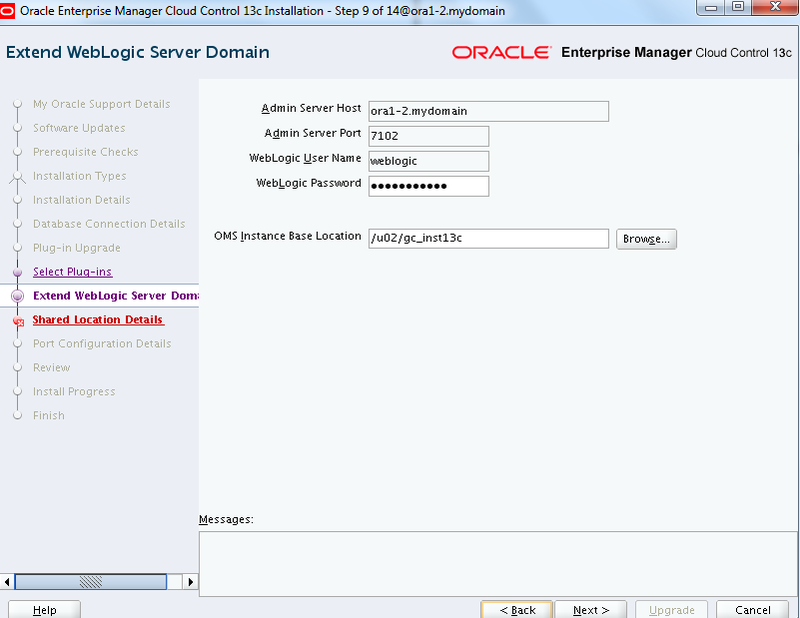 The environment used here has the Cloud control 12c installed on OEL 6 with the repository database of version 12.1.0.2 which is a non-CDB and has the 12c agents deployed on linux machine of release 6 (OEL 6). Make sure that the “COMPATIBLE” parameter on the OMS respository database is set to 12.1.0.2.0. If the adaptive optimizer feature (optimizer_adaptive_features) is enabled, then it needs to be disabled on the OMS repository database before upgrading it. If there are any invalid objects in the OMS Repository database, then those need to be validated. Take a backup of the current OMS. Refer the documentation “http://docs.oracle.com/cd/E24628_01/install.121/e24089/ha_backup_recover.htm#EMADV9639&#8221; on how to backup the OMS. 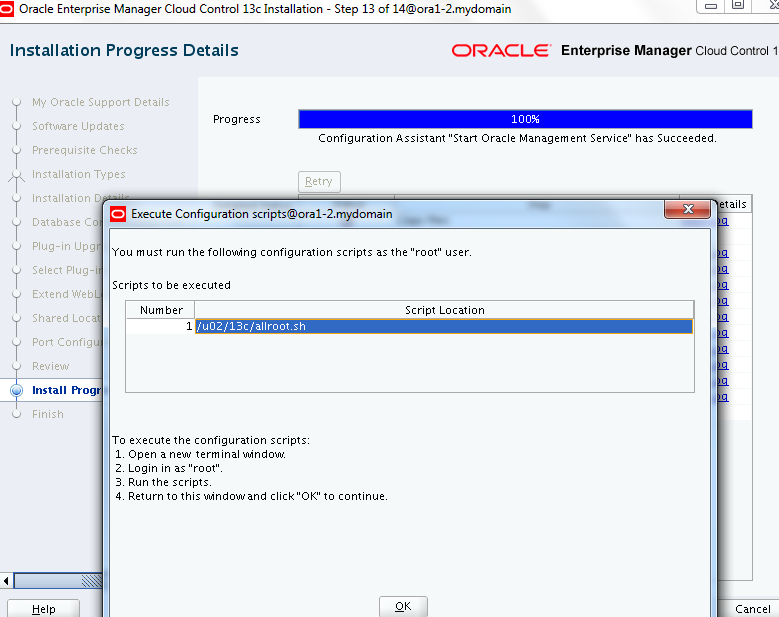 Copy the EMKEY from the exsting OMS to the existing management repository. EMKEY is the encryption key which is used by Enterprise Manager to encrypt/decrypt sensitive data such as passwords, preferred credentials. Stop all the components of OMS which includes WebTier, OMS and AdminServer. If there is an agent configured for the OMS server, then stop that too. 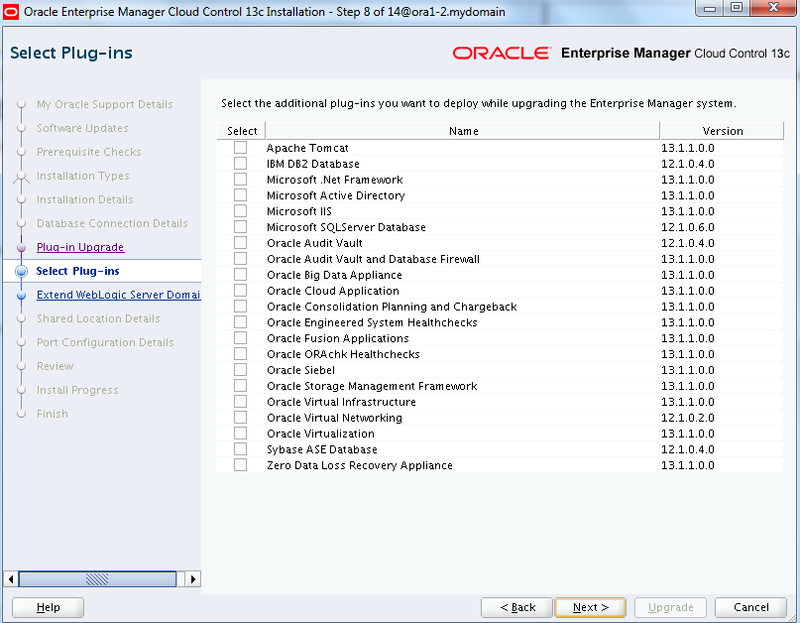 Copy all the EM13c software parts into a staging directory. I have them copied into directory “/u03/em13csoftware”. [oracle@ora1-2 u03]$ ls -lrt /u03/em13csoftware | grep -i "em"
Set the executable permission on the file “em13100_linux64.bin” which is the executable binary file. Execute the em13100_linux64.bin file to invoke the 13c GUI component. Launcher log file is /tmp/OraInstall2016-06-12_11-28-00AM/launcher2016-06-12_11-28-00AM.log. 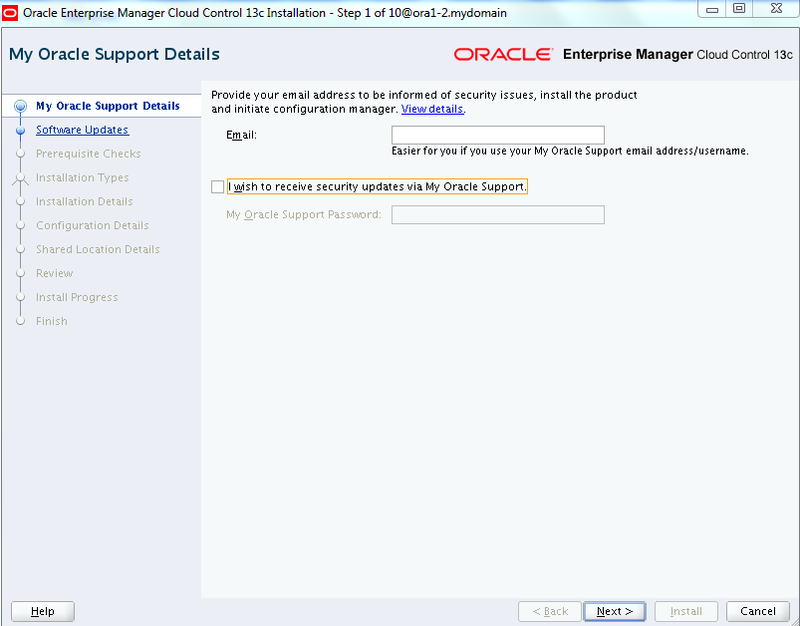 Provide the mail ID followed by password if you wish to receive the support updates and click NEXT. I would not like to search for the software update and hence chosing the SKIP option and clicking NEXT. Run the pre-requisite checks and if any discrepancy, then fix them before proceeding further. 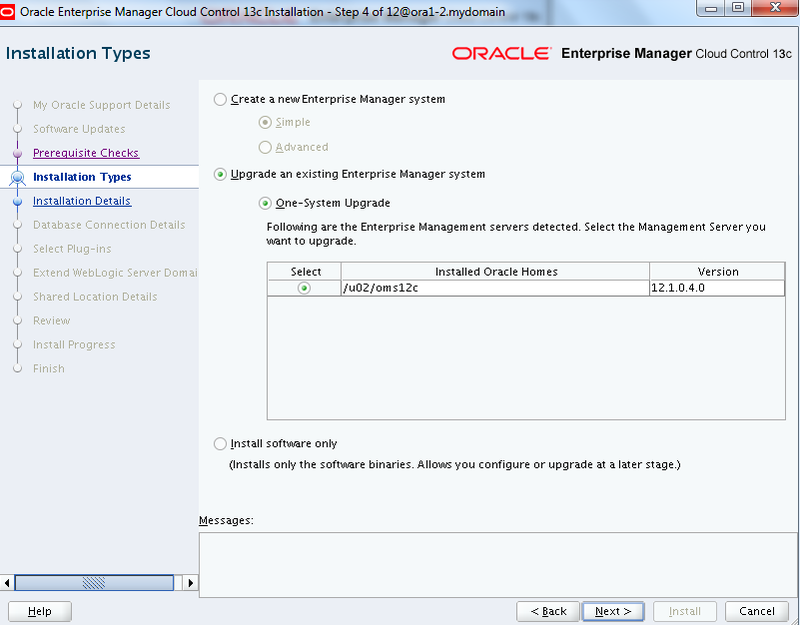 Since we are upgrading to 13c EM, select the “Upgrade an existing Enterprise Manager system” option and under this select the “One-System Upgrade” by selecting the 12c EM home. Enter the middleware home location. I’m installing 13c under the location “/u02/13c”. 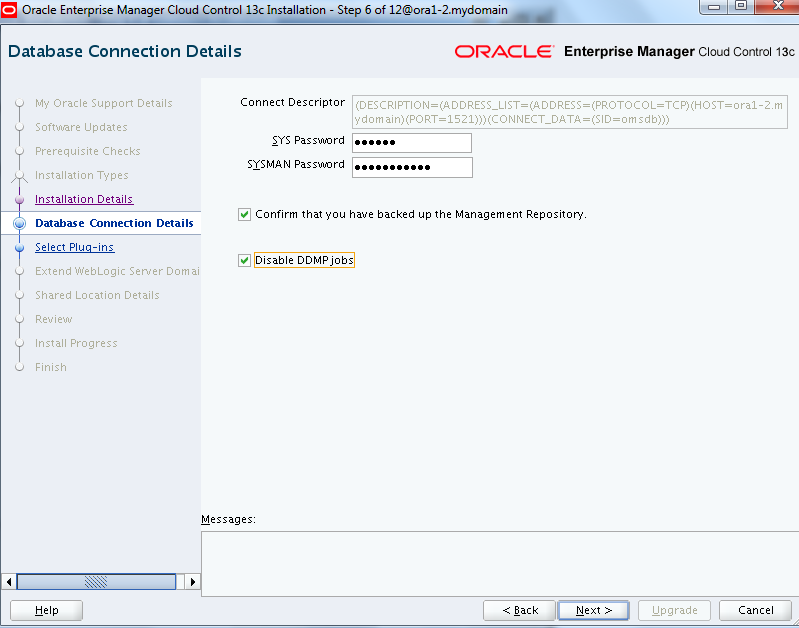 Oracle automatically captures the connect description details for the repository database. Provide the SYS and SYSMAN password. Also confirm that the Management Repository is backed up by checking the box. If you wish to stop the Enterprise Manager for post-upgradation maintenance, then check the “Disable DDMP jobs” and click NEXT button. In that case, the post-upgradation maintenance activity needs to be carried out manually. DDMP is Deferred Data Migration which is to migrate the format of the data from the previous release Enterprise Manager to the format used in 13c. If there are any pre-requisite checks at OMS repository database level failed, then review the recommendations provided. Click YES, if you would like the installer to take necessary actions else NO for a manual fix. Review the information on the plugins that will be upgraded and click Next. Select the additional plugins that you want to deploy and click Next. Fill in the WebLogic server details by specifying the password for the Weblogic User Name and also providing the OMS Instance Base Location. 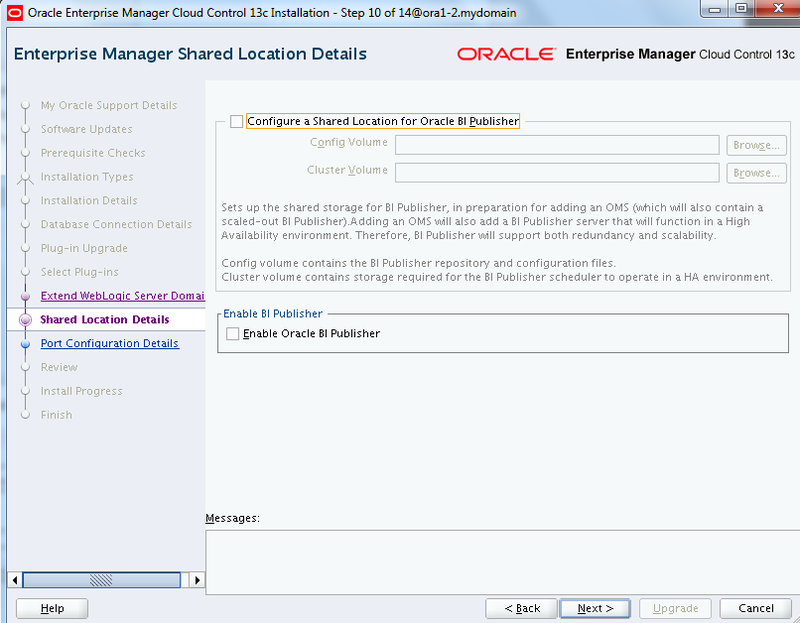 If you want to configure and enable BI publisher, you can select it here, else click Next. Review the default ports listed and click Next. Review the list of information provided and click on Upgrade to begin the upgrade. Run the “allroot.sh” script as ROOT user when prompted. 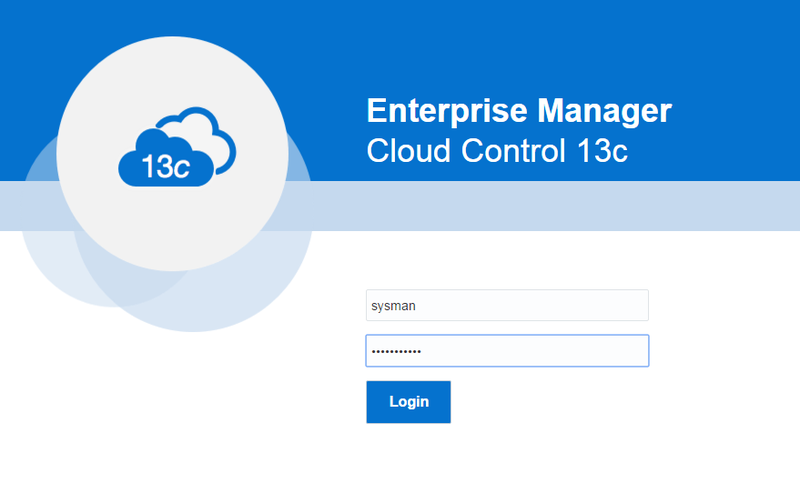 Login to the EM 13c through the browser with SYSMAN as the user and the password which was being used previously. 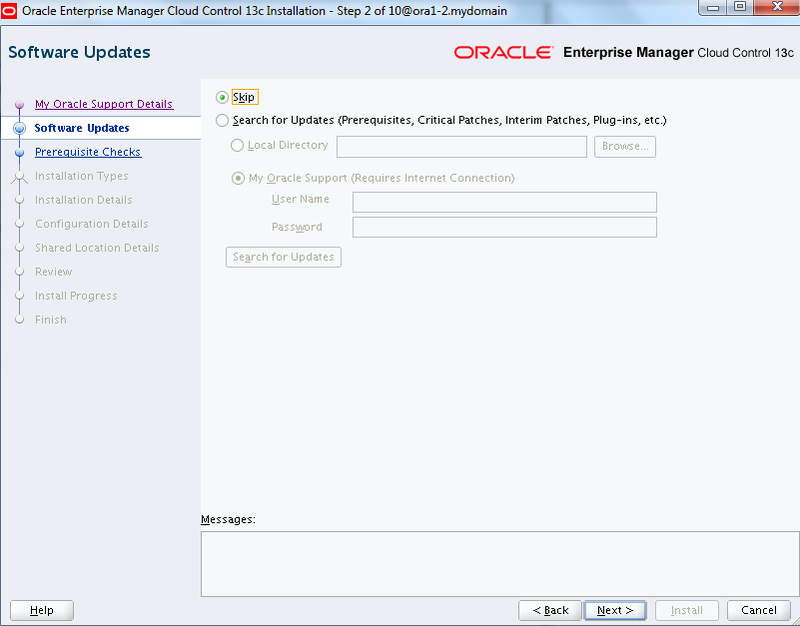 Review the OEM 13c summary page. 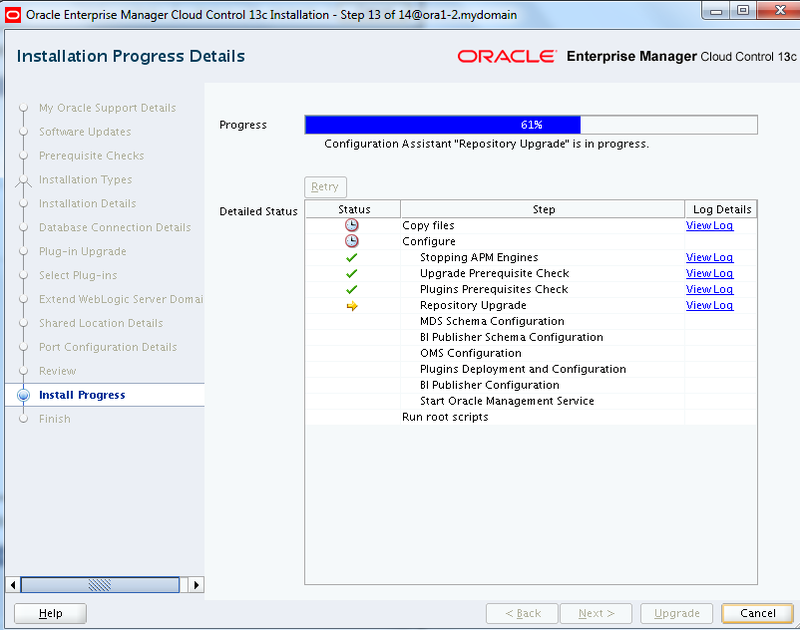 If you had disabled DDMP jobs while upgrading EM, you should consider to carry out the post upgrade tasks. Login to the EM 13c through the browser. On the summary page, click SETUP. 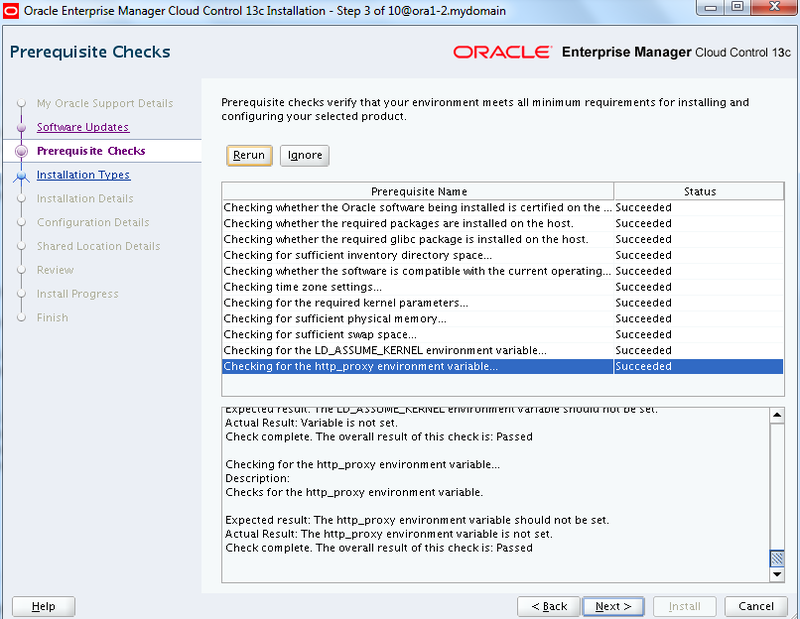 Under this, select “Manage Cloud Control” and then the “Post Upgrade Tasks” option. Click the “Start” option to start the post upgrade tasks. Review the status of the post upgrade tasks. As said previously, 13c agents can be configured on a Linux target machine whose version is not below 6. So, if you already have the 12c agent installed on a Linux machine which is less than version 6, then this cannot be considered to upgrade to 13c agent. 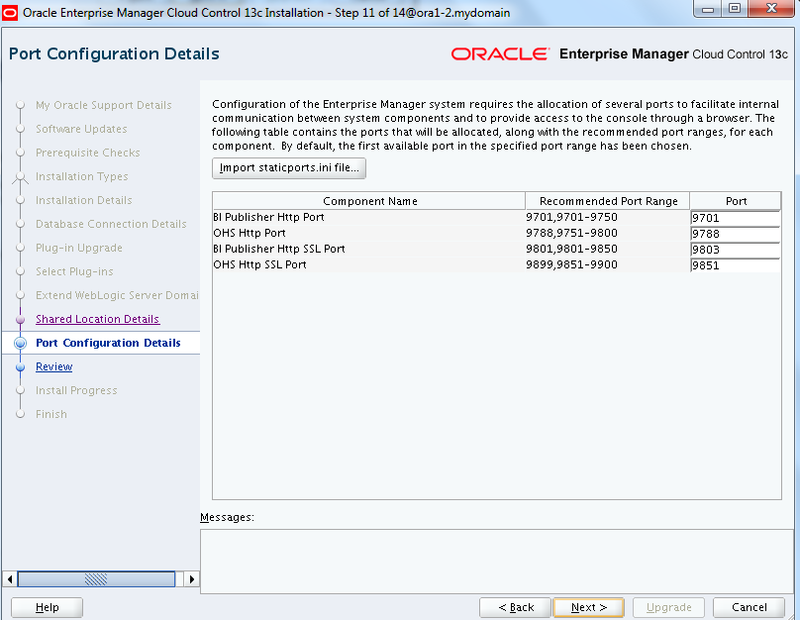 But, you can still use the old agent (12c agent) with EM 13c. 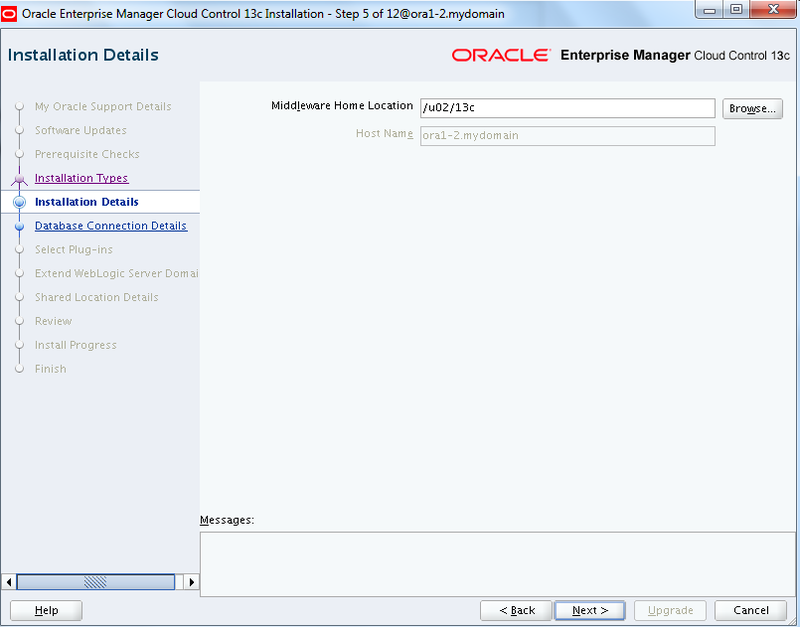 For the purpose of this demo, I had a 12c agent installed on my OMS host which is of version 6. So, I’m considering to upgrade this agent to 13c. Login to the EM 13c through the browser. On the summary page, click SETUP. Under this, select “Manage Cloud Control” and then the “Upgrade Agents” option. Click on the Add option under the “Agents for upgrade” option to view the list of agents that can be upgraded to 13c. Select the agent you desire to upgrade and click OK.
Review the information and click on Submit to upgrade the agent. After the agent upgrade, review the status manually. Agent upgrade installer creates a new directory called “agent_13.1.0.0.0” under the previous 12c agent directory.